Being human means that at times, your feelings could be hurt, you could be upset about how or why someone did what they did, or life throws a curve ball at you that’s upsetting. In my last blog, I mentioned that many “spiritual” people don’t want to accept, feel or acknowledge that they have anger and are reluctant to express it. People who habitually “under-express” anger or “hold it in” are so patterned about not speaking up, not being heard and feeling discounted, that when they finally find their voice, there’s so much enthusiasm about finally having a voice that their passion about speaking up causes them to “over-do” it! Yes, the pendulum swings to the other end of the spectrum. And that doesn’t work either. People who “over-do” anger may learn in an “Anger Management” course that they’re not supposed to express their anger, and they feel disingenuous or inauthentic while holding it in and not speaking up. They try to hold it in, even though it may “leak” out. They’re trying to swing their pendulum to the other end of the spectrum, and this doesn’t usually work either. at least agree on how you can both manage the situation differently in the future. Like learning how to drive a car. You can’t learn how to drive on a highway at 75 mph by driving 5 mph in a farmer’s field. And, you can’t learn to handle difficult curves on a road by only driving on a straightaway at 75 mph. You have to practice all speeds in all situations to master control of the car. Neither always driving at 5 mph or always at 75 mph will work or teach you mastery in all driving conditions. And, you don’t want to practice 75 mph on a curving mountain road. Mastering our emotions is similar. You don’t want to hurt anybody else, anything or yourself by allowing yourself to feel the big energy of anger in “real life” situations! You want to be in a safe space where you have full range to feel this energy without harming anyone or anything. I used to be afraid that if I let myself feel anger, the cells of my body would literally explode. When I gave myself the opportunity to consciously and deliberately, in a ritual container, feel that energy, I learned that anger is just energy. It happens to be a lot of it. And I didn’t have to let it control me so I’d do things I’d later regret! By experiencing the other end of the spectrum, I learned how to simply stand in the energy of anger, my own or someone else’s, and hold my ground. And speak, not withdraw or avoid. Maybe all I needed to say was, “Stop.” Or, “That was hurtful.” Or I’d ask a question and invite a conversation. If you’ve been following me or my work, you know that I help people create new neural pathways to embody and cultivate more of the gifts or each type, and disarm the challenges of each type. By doing this, we develop skillful communication and can speak up with integrity, honoring our best and highest self, the best and highest of the others involved with the best possible outcome in mind. Sometimes it means we have to change a little bit! 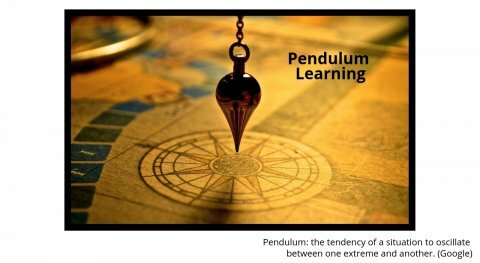 If you want to talk about where you are on your “pendulum learning curve,” click here to schedule a call with me. Please post your comments and questions — they’re always welcome!